The year was 1889, newspapers and journals of the day carried the stories of world events in much the same way as they do now. News from Paris said that the Eiffel Tower was finished. In America the great John.L.Sullivan was regularly being arrested for illegal bear-fist fighting. In this country, the Victorian era was nearing it’s end but we still had the Empire over which the sun did not set. Nearer to home the port of Liverpool was a busy and prosperous place. Although there were still sailing ships to be seen on the Mersey, they had, in the main be overtaken by progress and steam power ruled the seas. For weeks on end the local papers were dominated by reports on the infamous Maybrick poison case. Readers were daily entertained by sordid details of the affair, as journalists extracted the maximum amount of sensation from it. Nothing much changes. It is against this background that our story begins. Cross-country running was already an established pastime, and was rapidly growing in popularity. Liverpool and the surrounding district was a hot-bed of the sport, and boasted of several established clubs. Liverpool Harriers who were originally known as All Saints (Liverpool) harriers, were the most powerful force and indeed won the Northern Counties Championships every year from 1883-1886. There were other clubs with the colourful names of Cheshire Tally Ho Hare and Hounds, Wirral Hare and Hounds. Historical sources tell us that cross-country grew out a need for cyclists and other sportsmen to maintain a standard of fitness during the winter months. A hundred years ago, farmers did not plough up their land and re-sow it for the next years crop immediately after harvest. the field was left to lie fallow during the winter, and so it was possible to run over them without causing damage. In those early days, Cycling and Harriers clubs would be affiliated to both Cycling and Running Associations because of the inter-relatedness of the two activities within the same club. It was from one such club that Sefton Harriers emerged. The Sefton and dingle Bicycle Club had been established for many years in the south end of Liverpool. It is know that some members of the famous Anfield Bicycle Club, founded in 1879, came from the Sefton and Dingle. In 1889 some members of the Sefton and Dingle Bicycle Club were drawn towards the running discipline began to pursue their particular more exclusively, and so Sefton Harriers came into existence. It was more a “growing away from”. Good relations continued to exist between the two clubs. In the Liverpool Echo dated Saturday 28th September 1889 it was reported that “H.P Ellis, the well-known handicapper, had been elected the President of Sefton and Dingle Bicycle Club”. In our own Club records, at the General Meeting held on the 5th April 1892, the same gentleman is shown as being elected Vice-President of Sefton Harriers. In those early years, Club records show that the majority of our membership came from Dingle, and the south end of Liverpool in general. Membership grew at a healthy rate, and by the mid 1890s we seemed to be casting our net wider as runners the Everton, Wavertree and Edge Hill districts joined us. Membership seemed to rise and fall in quite large numbers at a time. As many as 15 members would be elected at one time; but on the 20th March 1893, 27 members were expelled for non-payment of subs. were in their turn captains; W.S.Collett holding the office for five years from 1895 to 1899. The recalling of another name in that team; A.J.Allen; strikes a sad note. A.J. (Artie) Allen who was a prominent member of our Club, was killed in action at the famous battle of the Spion Kop in 1901 during the South African war. He was in each team that won the Liverpool and District Championships in 1893-4-5. His death was reported in the “Harrier” column of the Liverpool (Football) Echo in that year. “Cross-country runners of half a dozen years ago will well remember Arthur J. Allen of Sefton Harriers. It is my painful duty to have to record his death in the fight at Spion Kop. A little over three years ago he enlisted in the 2nd Lancashire Fusiliers and by strict attention to duties he soon rose to the rank of corporal. He saw fighting at Crete and was with Kitchener at Omdurman and at the end of November last, obtained a few days to pay a flying visit to his family and friends prior to going out to South Africa. He was present at a handicap of his club at Wavertree on 25th November. He was a cross country runner of no mean ability, and in the first Championship of the Liverpool and District Cross-country Association in 1892 he finished 7th and his club took third prize. In 1893, 1894 and 1895 he ran prominently in the same race and assisted his club in winning the Championship in those years, and was in the Sefton team that ran second to the redoubtable Salford Harriers in the Northern Counties Championship in 1893. Many who saw the Liverpool and District Championship at Aintree in 1894 were of the opinion that he could have won the individual championship had he liked, but generous as he always was, he would not beat his clubmate, who was leading in the straight, and Allen finished second that year. In that year he beat such runners as Watterson A.B George, Nancarrow, Paddy Shay, Farrell, Pulford, Collet &c.
That he was as a good solider as he was an athlete is proved by his rapid advancement to Coroporal, and at the time he fell he passed his examination sergeant. He was universally liked, and all who new “Artie” as he was popularly known, will join me in expressing deep sympathy with his family”. 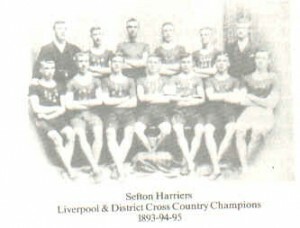 In the period between our foundation and the outbreak of the First World War in 1914, Sefton Harriers were Liverpool and District Cross Country Champions seven times. We also provided seven individual winners. They were palmy days indeed with so many runners of this class. We extended our sphere of influence on cross-country when in 1908 the great W.T.Clarke won the Northern Counties Championship and Sefton took the bronze medals in the team race. In the same year, Clarke finished 5th in the International Championships. This was a wonderful year for W.T.Clarke, and to crown it, he was selected to represent Great Britain in the Olympic Games in London, finishing 12th place in the marathon. W.T.Clarke brought many honours to our Club, and he ranks high in the Sefton Hall of Fame. When his name first appeared on the Club records, it was on his being elected as a new member on 24th July 1905. Who then could have foretold the impact he was to make on the Clubs fortunes in the years that followed. In those days it was a much more accepted practise, than it is now, for runners, particularly the more prominent ones, to move from club to club. The sport was still young, and the structure of rules by which it is governed today, had yet to fully evolve. Around the years of 1904/1905 we were joined by the legendary J.T.Rimmer. His name first appears on Club documents on 2nd May 1905, where he is shown as being entered for the Winnet Cup along with J.Roberts, J.Edge,and S.Francom, J.Wooley and J.Rigby. J.T.Rimmer was already famous when he joined Sefton. In 1900 at Paris Olympiad, he won the 4,000 metres Steeplechase in a time of 12 mins 58.4 secs. In the same year just prior to the Olympic Games, Jack won the A.A.As 4 mile track Championship, and he, along with fellow A.A.As champions. A.E.Tysoe (880yds) and C.Bennett (1 mile) comprised the Great Britain’s winning team in the 5000 metres team race in Paris. Prior to joining Sefton, Jack had been a member of Liverpool Harriers, and also Southport Harriers. It was with the latter club that he won the Northern Cross Country Championships in 1901. his strength and stamina were remarkable, despite his his long and almost skinny frame. There is a famous of his taking a challenge to race against the best miler in each of the seven divisions of Liverpool City Police. This event took place at the Annual Liverpool City Police Athletics Meeting. The Police milers were to run 7×1 mile relay, whilst jack ran the whole of the seven miles. Seven prizes were on offer; one for each of the mile stages. Jack Rimmer won all seven! He was a member of the much feared Sefton team of Rimmer, J.Roberts and S. Francom and W.T.Clarke which won the Haackenschmidt Cup for a marathon race in Scotland, in 1901 and 1911. They must have been a formidable squad for any club to to take on with three Liverpool and District, and two northern Champions amongst them. J.T.Rimmer’s victories were so numerous that his running career merits a book to it’s self. He is probably the greatest middle and long distance runner ever produced on Merseyside. The author joined Sefton in 1954 and it a treasured memory, that he was introduced to, and shook hands with Jack Rimmer, who in his 77th year was still President of the Club. J.T.Rimmer and W.T.Clarke were of course, the stars of this era, but let us not forget the Club made up of many members, who, no matter how humble or average an athlete, have all played their part in the continuing history of Sefton Harriers. the author in his 35 years as a Seftonian, has known many members during that time. They have come and gone. Some have stayed longer than others, but each one has added something; has woven his particular strand into the unbroken thread of over 100 years history. The athletes of course are the people who put the name of the Club in the public eye. To talk in the modern parlance, they are the ones given the “high profile”, and that is right. That is the nature of things; but clubs do not exist on the track and cross-country course. There is an infrastructure in all athletic clubs, without which the sport would not function. I refer of course to the administration side of things. in the process of preparing this history, it has been a privilege to spend many hours reading and absorbing as much written and printed matter as I could, related to our Club over the last 100 years. It has been a most rewarding experience, and the picture of the week to week; season to season round of tasks that has gradually emerged, is well worth the mention. As the poet Milton said “they also serve who only stand and wait”. 31st August 1893. “It was resolved to invite the following clubs to an invitation race: Liverpool Harriers, West Cheshire, Wirral Hare and Hounds, South Liverpool Harriers, Roby Harriers, Walton North Liverpool Gymnasium Harriers, Excelsior, Florence, Birkenhead Gymnasium Harriers, Pembroke, Gordon Institute, Domestic Mission and Warrington. Race to start 4pm Pacemakers, Messrs E.Bagot, H.Pulford, and C.Blutt. Whips Messrs J.Walker, A.Jones, A.Allen, and A.Geddes. Trail to be laid by Mr Wooley. Prizes to be given as follows, First, second and third home in break, and gold centre medals for 1st and 2nd novice, and prize value of £1 for secretary of the club with the biggest muster. Also a cab to be provided for the starter of the break and following gentlemen to act as judges; Messrs H.P.Ellis, J.Leather Jnr, and A Shingler. Mr A.M.McTaggart to act as official bugler”. This was still in the age of paper trail cross-country running, and everything had to be done in strict accordance with the conventions of the time. At it’s inception cross-country running had taken on the form of the hunt”, along with the terminology of that pursuit. The “whips” or “whippers in” ran along either side of the pack and kept the runners together in an orderly manner. Who won the race was decided in the “break” which was over the last part of the course. The “bugler” has a quaint sound to it, and smacks of the hunting horn. The present members of the Committee are familiar with the annual discussions about transport to the Northern and National Championships, and the attendant problems of expense. They may find some amusement in the following extract from the Committee Meeting on 3rd February 1896; “A proposition was moved and carried that we send a team to compete in the Northern Counties Cross-Country Championships, and the fares of 9 runners to be paid by the Club. Fares to Rochdale 9at 2/9 = £1/4/9d.” Even at those prices, it was probably a headache for the Hon. Treasurer. In the spring of the following year, a number of our members, whilst training in Sefton Park Cricket ground, were stopped by a park-keeper and a policeman, and with no reason was given. When this incident was reported to the Club Committee, the Hon Secretary took up the matter with the Parks and Gardens Committee of the Liverpool City Council. This approach received immediate attention from the City fathers, as well as gaining support for us from several City Councillors. at the subsequent meeting with the Park Superintendent, the Hon Secretary was invited to select a piece of land in Sefton Park for the purpose of training, and he choose Farm Field. The Superintendent agreed to the putting out of flags to define a course, and suggested that “a canvas screen of triangular shape be purchased for runners to dress in so that there would be no complaints of indecency”. Would that we could get such cooperation from local authority in these enlightened times. Whilst we know that Harriers clubs were started with winter cross-country running as the main reason, the summer side of the sport was also developing, and Sefton were soon involved in the regular promotion of track meetings. For many years during this early period, Wednesday evening handicap meetings were a regular feature, and almost always, the programme included cycling events as well as running races. Records show the annual Good Friday meeting was regarded as very important, and was given a high priority in the business of the Club. these meetings were usually joint ventures with other clubs. Liverpool Harriers, Pembroke and even Liverpool Leek Cycling Club and East Liverpool Wheelers, were our partners at differing times. From time to time there was dissension between the promoting clubs, and one year we fell out with Pembroke who wanted to take two-thirds of the gate money. Sefton insisted on having half. There was obviously a great deal of prestige at stake in the Good Friday meeting. Each year Sefton, Pembroke and Liverpool would try to be the first to apply for, and be granted the permit from the N.C.A.A, and also book the ground. During this period there was a constant battle to keep one’s club in funds, and these Meetings were one of the main sources of income. Crowds of a considerable size were anticipated to come and pay at the gate. Thousands of handbills were printed and distributed, and all officials were paid. The following details relate to the Evening Handicap Meeting in May 1901. Amongst the varied athletics activities that Sefton were involved in, the discipline of race-walking emerged, and for several years was included in these meetings. we did produce one very successful walker; in 1912 our own R.Wilkinson was a member of the British Olympic team. It is interesting to note that during the period dealt with in this chapter, venues of Committee Meetings and general Meeting were many, but not so varied. They were mostly in public houses. The Brook House Smithdown Rd, Bee Hotel St John’s Lane, Star and Garter Queens Square, Travellers Rest Aigburth Vale, the Park Road Cocoa Rooms (perhaps the abstainers were in the ascendancy then) and the Coffee House Hotel Wavertree. A Topic that is from time to time discussed informally amongst members, is that of our Club colours. There is a long held belief, call it folk memory, or an oral tradition, that our founding colours were red jersey with a black diamond shaped badge on the front, and in 1893 we changed to black and white hooped jerseys. On scrutiny of the Club minute books, there are entries which give cause to re-think this question. The author lays the details before you. At a General Meeting held at Park Road Coca Rooms on 13th September 1892, a motion was proposed and eventually carried by a majority of nine “that the colours be as previous viz. black and white”. Further at the General Meeting at the same venue on 21st April 1893, Rule 9 was altered to read, “That the Club’s colours be a red jersey with white badge on black diamond shape and bearing the Club’s monogram, balck drawers with a gold stripe”. The latter change is the complete reversal of what we believed all this time. The author has pondered over these conflicting notions, and after some Sherlock Holmes type deductions, offers the following thoughts. The rule change in 1892, back to previous black and white, could imply that these were the colours of the club that we emerged from i.e., the Sefton and Dingle Bicycle Club. the change to red jerseys in 1893 we can accept, as this is borne out by what the runners are wearing in the photograph reproduced in this book, of Sefton Harriers as the 1893/4/5 Liverpool and District Champions. The team is clearly not wearing black and white hoops. The jerseys they have on are of a plain colour, which could be red. In addition, the man 3rd from the left on the back row, wears a jersey which shows the diamond shape on the front. the earliest evidence that we have to hand of our wearing black and white hoops, is the photograph of W.T.Clarke at the time of winning the Counties Cross-country Championship in 1908. The date is clearly written on the photograph. The photograph referred to appears in Dr Phil Thomas’s “Centenary History of the Northern Counties Cross-Country Association”. a work to which the author is indebted as a very useful reference point in the process of compiling this history. Based on these details it would be reasonable to assume that at a date sometime between 1895 and 1908 we changed the colours to the now familiar black and white hoops, although there is no entry in the minute book to show this. If there is anyone amongst the readers of this book, who can throw any light on this shady area, the author will be pleased to know of it. Another entry worth relating is that made at a Committee Meeting on 2nd December 1898, “The Hon Secretary reported that a number of members were desirous of participating in a football match on the morning of Boxing Day, and that he had made enquiries, and found that the Liverpool Harriers were willing, and would find a ground, ball and ambulance, and it was resolved to leave the matter in the hands of the Hon Secretary”. It sounded as if trouble was expected! maybe football violence is not such a recent phenomenon. The unfortunate circumstances of our not having a permanent headquarters for the Club, in this our centenary year, led to contemplation on where we have met, and gone about our activities in the past. Existing members whose association with Sefton dates from anytime prior to the mid 1970s, will remember West Derby Village Hall as our cross-country season venue for many years. For the author it is synonymous with Saturday afternoons, muddy shoes, cups of tea, animated conversation and general good fellowship. At on e point it seemed as if that was the way it had always been, and that it would go on forever. But in reality we all know that everything must change, and over the course of 100 years, Sefton Harriers have changed their headquarters many times. west derby Village Hall was our headquarters for over fifty years after we had moved there in 1919/20 cross-country season. But we anticipated the future, and have not yet reached that point in this history. In 1899 we moved to the Coffee House Hotel, Wavertree. At the October Committee Meeting of that year, it was reported the accommodation could be secured for £1/1/- for the season! several entries of earlier date infer, and it would be reasonable to assume, that the Club foregathered for several years at the Brook House Hotel, Smithdown Road. The Coffee House appears to have been a very popular meeting place in those days, as other clubs apart from Sefton, have used it at different times. In these times of rapid accelerating change, there is some small comfort to be derived that these two long established are still in existence, as is the lamb Hotel, Picton Rd (should read High street) where we set up our headquarters in 1905. There we remained until the season of 1908/9 season when we took up residence in Aigburth Peoples Hall. By 1910 we had moved yet again; this time to Stanley Stadium. The present whole sale fruit and vegetable market now stands on the site. Another three years saw us leaving Stanley and moving to Knotty Ash in 1913 season. Whether this frequent moving of one’s headquarters was a common feature among other clubs at that period is not known, but from our own records, we seem to take on the appearance of a group of itinerants. Itinerants or not we have survived to our Centenary, and are of “no fixed abode” at this present day. In many ways it would be a satisfactory situation for the Club to set up a permanent H.Q., but to take a philosophical view, the author believes that our strength and resilience comes from our membership, and not from bricks and motor in a particular geographical location. Throughout those early years, amongst the reports of successes and failures, and the coming and goings of the Club headquarters, there runs a constant theme of financial difficulties ; an endless succession of headquarters for the Hon Treasurer as he endeavours to make ends meet. There is a long tradition in the Club of generosity towards it’s members, As far as our financial resources would allow, we have always tried to give assistance with traveling expenses to Championships and special events. This custom dates right back to the early years, and on some occasions, private saloons were reserved for our teams on railway journeys. This open-handedness has sometimes created problems of solvency. Many times these difficulties were overcome by the generosity of our own patrons. During the early part of this century, the practise of patronage was widespread, and almost all amateur sports clubs had their connections with wealthy, famous and influential people, to add prestige and a sense of security and substance to their affairs. We could consider present day sponsorship of the sport is the modern equivalent; through not precisely. The fundamental difference being, the patrons did not expect or want any return for largess, as today’s sponsor does in displaying of his name and wares. Sefton Harriers had their patrons like everybody else, and their generosity frequently kept the Club out of financial difficulties. From 1905 to 1913 and from 1915 to 1917 Mr J.A.Behn was our President, and from interpretation of the records, he also played the role of benevolent guardian angel. Several times did he save the situation, and one such instance is shown in the minute book, when in April 1907, we could not afford to send a team to the Nottingham Forest invitation relay. Mr Behn stepped into the breach and offered to pay each man’s fare up to 10/- each. They were worrying times for the Hon Treasurer, and although more recent holders of that office have had their problems, it is doubtful if they would want to change places with their predecessors of those days. At one time we were so much in arrears with training fees owing to Stanley Stadium, legal proceedings were threatened. Mr Behn intervened and once again his open-handedness saved the day. He was not just a figurehead and a benefactor; he took a very active part in Club affairs; chairing meetings, refereeing and judging at many events. He was a Seftonian in the grand manner, and though he ceased his Presidency of the Club in 1917 his name continued to appear on our list of patrons into the 1930s along with Jack Sharp, the Earl of Sefton, Lord Wavertree and many others. “Cash flow”, as we now call it, continued to be a matter of concern right up to the start of the First World War. on 28 July 1913 an Extraordinary general Meeting was called to discuss what could be done to bring more funds into the Club. this was held at the Stanley Hotel and some of the suggestions made for fund raising are worth recalling here. “After a most lengthy discussion it was decided to start a subscription amongst members for support, either by a donation or a loan, same receiving the unanimous support of all present”. Also Mr Punton proposed the Club should form a baseball section which would in time financially benefit the Club”. “Mr Waterson proposed another evening meeting and offered his services as a starter free”. “Mr Gowan proposed that if the meeting was success, a Saturday meeting be held at which a Boxing contest be held”. There was an amendment to this proposal by Mr Hodgson that it should be a Football dribbling contest instead of Boxing. This was agreed. There were obviously entrepreneurs about in those days, and diversification is not modern phenomenon. All of these ideas helped the Club in their various ways, as well as a measure of self-sacrifice on behalf of some members. Prize winners during the winter of 1906/7 season forwent their prizes until the Club’s financial sate was healthier. This was not the only instance of unselfishness shown by Club members. It would be reasonable to view all this against the background of the social conditions of the day. They were hard times for ordinary folk and the fact that in November 1907, 87 members were crossed off the books for non-payment of subs, suggests that a lot of people were having difficulties in making ends meet. The current healthy state of Club finances, and the almost non-existence of sub defaulters, is not only a tribute to our Hon Treasurer, but also an indicator that as society, we have lived through harder times in the past. In finishing this chapter, an attempt has been made to tell the story of a very exciting and rich period in the history of Sefton Harriers. right from the beginning we were involved in athletics at local , national and at times international level. Despite the rise and falls in fortune, which all clubs experience at some time, the spirit of enthusiasm and dedication to the sport in general, and the Club in particular. shown by those early Seftonians, alid the foundations of something that was to become very special for succeeding generations. The year 1914brought more honour to Sefton when our team of J.N.C Davies, R.H. Blackledge, R.H Hodgson, and A.E Lovelady won the Lancashire relay Championship at Liverpool Tramways sports ground on 28th June. On the continent the dogs of war were out; storm clouds were gathering, and Europe was about to be plunged into the bloodiest conflict in it’s history. At home things appeared to be very much normal. No entry appears on the Club records to mark the commencement of hostilities against Germany on August 4th. Why should there be? It all seemed too far away to effect most peoples everyday lives. but it did before long, and we at home were soon to know that we were at War.